Because of its light weight, the wheel load scale WL 103 is easy to transport and can be used at any time without the need of ramps. For efficient measurements, it is recommended to work with at least two units. Measurements should be made on firm and level ground. The scale is placed close to in front of the wheel to be tested and the vehicle is driven onto the platform. The wheel load is indicated directly on the digital liquid crystal display. With a connecting cable, two scales can be used as an axle load scale. 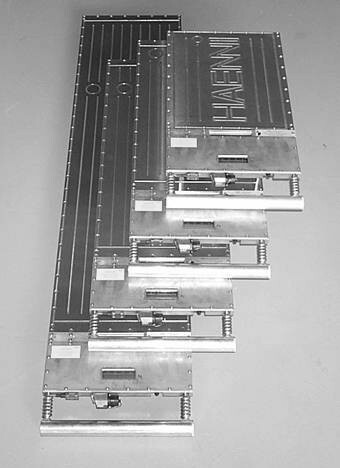 Up to 12 scales can be connected serially to a separate processing unit or to a personal computer. OIML No. 76 Class 4, optionally with HAENNI works test report or intended for official test.